Your A-Z guide on how to live a plastic free life! 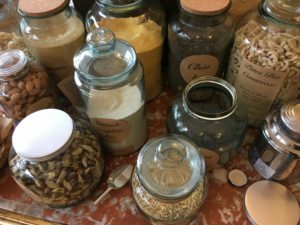 Check out my guide for plastic free July here. Yeesh, don’t get me started on the waste of the airline industry in general! But a simple step you can take to dramatically reduce your plastic waste when flying is bringing a canteen with you when you fly.I bring a canteen with me every time I fly and fill it once I’m past airport security, and usually I get through a decent amount of the flight just drinking from that. Flight attendants often give you a new plastic cup every time you ask for a drink. Instead, I ask them to fill my canteen as much as they would a regular glass (to keep the rations fair!). 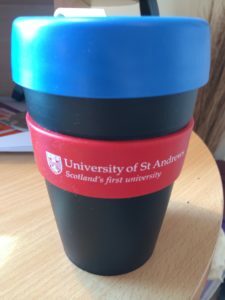 Sure, they are serving me out of plastic bottles, which is still not great, but I would love it if plastic cups eventually became a thing of the past. Back to basics (bakers): You can easily buy fresh bread from the baker – often it can come in plastic, but approach the counter and ask them to put it into your own biobag/cloth bag. Often these loaves are fresher too. Bring your own cloth or biobag to the cheese counter at your local supermarket. Try to avoid pre-packaged cheese: it’s covered in light monofilm plastic (making it impossible to recycle) and often has added preservatives. 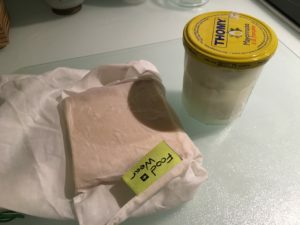 This is how I buy dry (left, gruyère) and wet (right, mozzarella) cheese. Once I get home I take the cheese out of the cloth bag (otherwise it dries out) and put it in my glass container. Vinegar and sodium bicarbonate (baking soda) is a really effective cleaning product, and doesn’t leave a smell as you might expect. This mix can clean everything, from dirty plates to toilets. Use old, worn down clothes as cleaning rags to take your waste-free life even further. You can add essential oil to your trusty vinegar and bicarb to leave your home smelling fresh! Another option, which is a bit of a compromise on the plastic ban is choosing natural “earth friendly” cleaning products that avoid the chemicals used in conventional cleaning products. 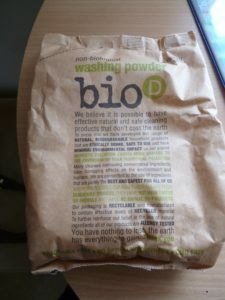 When I was university we bought a student flat starter set from www.greenbrands.co.uk, which included dish soap, parsley spray cleaner, concentrated laundry detergent made from natural planet extracts, a scourer and a biodegradable, plastic-free washing up loofah. It was awesome! Fast fashion is a problem. Not only because of the social implications of dodgy labour practices, but also they come at a high cost to the environment. Generally any industry that is telling you to consume, consume, consume sends up some red flags. As much as I love looking “fly”, sometimes you have to sit back and wonder if you can take part in an industry that causes a whole lot of pain to a whole of people and to our planet. Shop second-hand. Check out gems at charity shops – takes a bit more time and some vision to see what clothes could be, rather than what they are, but it’s good fun! Avoid synthetic fibres – Microfibres are a huge problem. Here are some top tips from the Plastic Pollution Coalition – but to sum it up, buy and wear clothes made of natural fibre (think cotton, linen etc) and avoid synthetic fibres like polyester and nylon. Carrying your own containers when you go to the grocery store makes a world of a difference. When I explain why I have my own container and a little bit about my lifestyle, most store managers are more than happy to let me use my own container. If they refuse (sometimes it happens), politely explain that you understand but that you would rather take your business elsewhere. Maybe they’ll call you on your bluff. If not, their loss. Bringing your own container when you go out to eat is also a great idea, because it means you don’t have to stuff yourself at the meal. It’s the equivalent of asking for a doggy bag, but just bringing the container yourself. Most restaurants will not have any issue with this, or at least none of the ones I’ve tried. 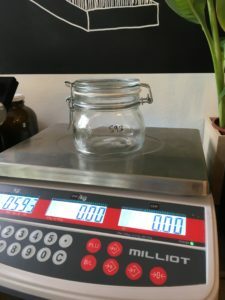 To buy in bulk, you will take a container, write down the tare weight (weight of the jar) and put your stuff inside. When they go to weigh the product, they will subtract the tare weight from the total weight to give the proper price. Deodorant bars: At first I used a bar of Aromaco from Lush, but it wasn’t working too well for me – I found it melted and made my hands a bit sticky. The deodorant comes in compostable packaging, but for convenience, I placed it in a reused tin in my bathroom. I’ve recently started using ‘Teo’ which I’ve really liked – it’s dry and smells so lemony and fresh. Make your own: I made my first batch in December and it was surprisingly easy and works well! The laziest option – and by far my favourite so far: wet your finger, stick it in some baking soda, rub it into your armpit and you’re DONE. It works. Trust me. 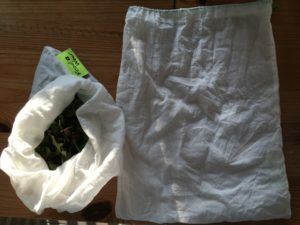 Cloth for loose fruits and veg (produce bags). If at a large grocery store with electronic weighing scales with stickers, then grab a piece of paper from your bin and stick all stickers on that, and present it at the checkout. 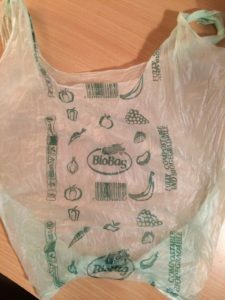 I bought these ‘biobags’ online when I first went plastic free, but honestly there’s a lot of greenwashing out there around the word “biodegradable”. It’s important that we understand the difference between biodegradable and bioplastics. 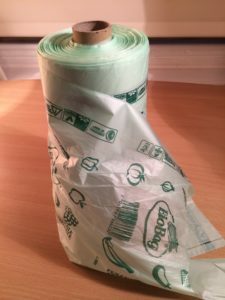 Biodegradable means that it will technically break down and compose into non-harmful bi-products, but sometimes these biodegradable products need to be dealt with in a specific facility, e.g. one with extremely high heat. Also, biodegradable plastics, if mis-managed, can still end up harming animals in the wild. A piece of biodegradable plastic that takes 20 years to break down can still choke a seabird or cow while it’s on the planet! Bioplastics refer to the ingredients list, meaning made of renewable resources such as corn, potatoes or sugarcane (for example). However, it is like fuel-based “normal” plastic in other ways. The term bioplastic doesn’t say anything about its degradability. – does 300 biobags seem like enough??? 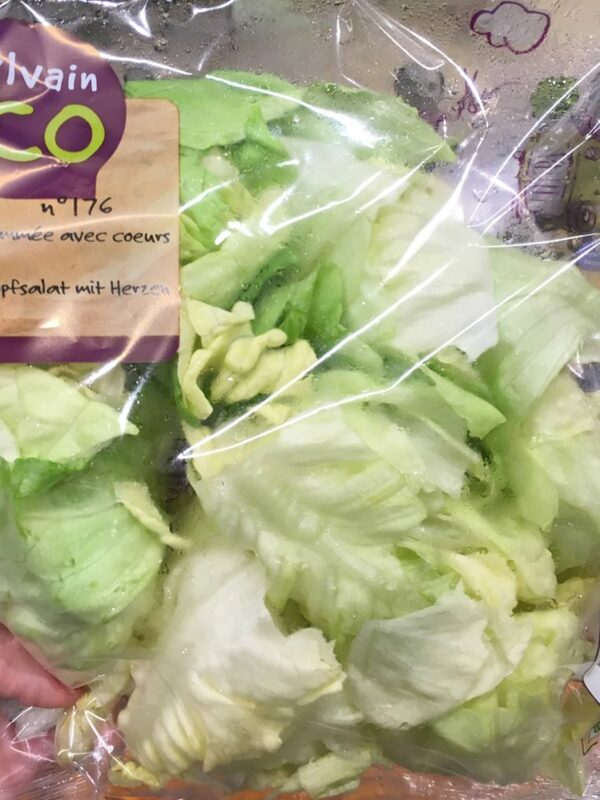 If you’re shopping at a regular grocery store where you’ll get stickers for products weighed, stick them either directly onto the bag, onto another item in your cart (e.g. your box of pasta) or a piece of scrap paper for recycling. 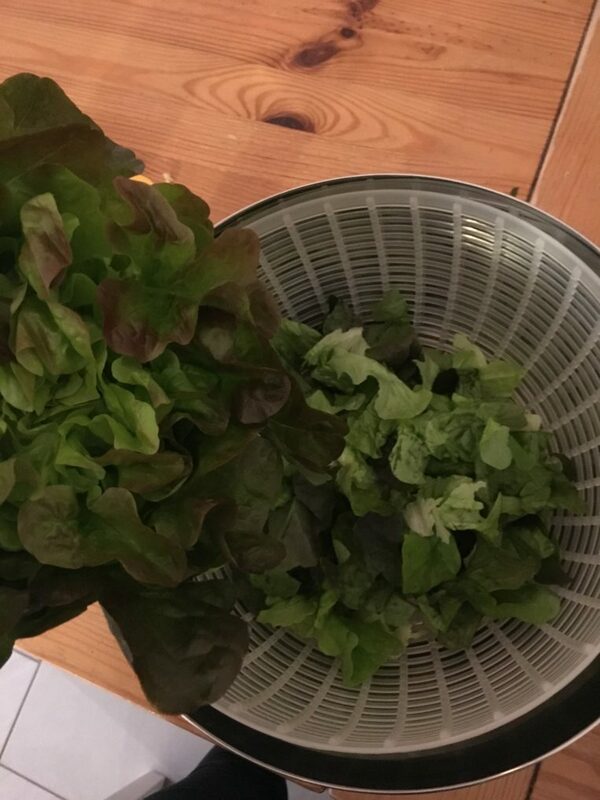 While I was still living in Scotland, I used to get a VegBox! What is this strange word, you may ask? A box of seasonal vegetables from local farmers ready to pick up every week! What’s tastier than locally grown organic food? If you can’t get a vegetable distribution scheme, don’t fret! Depending on where you live, farms are not always nearby. 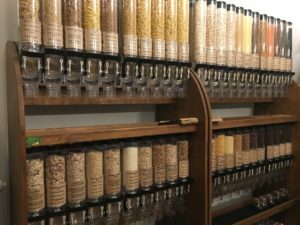 You can still shop zero waste at a regular grocery store! Just use your produce bags! When I was still living in Fife, I joined ‘Fife Diet’, a government initiative to encourage eating locally. They send recipe books for what grows seasonally in Fife – all for free! They have suggestions on how to eat locally, then a year round guide, and a recipe book every season. It’s awesome! See if they have something like this in your local community. 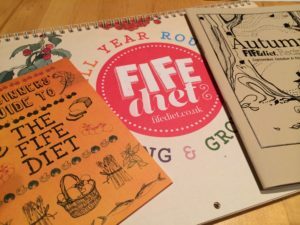 – The Fife Diet wall calendar, with suggestions on when to plant and harvest seasonal fruit and vegetables, a beginner’s guide, and the Autumn recipe booklet! I mentioned the grocery bags issue in my condensed guide. Cut out these and plastic bottles and that’s a huge reduction in your plastic footprint. And then I have large three cotton bags that I use for grocery shopping and for general carrying needs. It’s a super simple change that will dramatically alter the amount of plastic you use. So worth it! Totally underrated, is all I’ll say! Plus tissues produce lots of waste. You can make tons of handkerchiefs out of old clothes that are too ratty to donate – may sound a little hippy chick, but I’ve been getting on fine! This unfortunately falls under frozen foods, which I haven’t purchased in long time. However, my flatmate makes the most wonderful homemade icecream. For those of you who don’t have amazing chefs for roommates, I recommend trying it yourself – it’s a fun activity and super tasty!! This is an easy one to fix! I used to buy a paper bag of washing powder from Oxfam’s line of biodegradable and natural household products – super great and easy to use. I also recently found a small line of laundry detergent bags that use all natural products to clean and are packaged within compostable bags. Some bulk stores also allow you to buy laundry liquid in bulk!! (Which is what I’ve been doing for the last 2-ish years). Use a wash cloth – wet it, rub off make up. Rinse, repeat, wash regularly. For harder stuff like waterproof mascara: apparently this is a miracle item: make-up remover cloths. I bought some from a small local shop made from organic cotton. Watch out for the Sephora one as it’s made from polyester and will lead to microfibres being released into the water! Bring your own container – and go down to your local butcher’s. This is also a hard one, because medicine has been totally revolutionized by the invention of plastic. I need my plastic inhalers, and any other medicine I use is all packaged in plastic. I will say that since I started this project, I’ve stopped using cold medicines, which rarely do anything, and instead when I feel sick I just rely on hot water with honey that I buy from the local farmers market and lemon. That usually does the trick! The average woman will apparently go through over 11,000 tampons in her lifetime! That’s wild. Not only are they packaged in plastic and will end up in a landfill after use, they can create dryness and cause irritation where you least want those two things! What’s that? There’s a convenient and easy-to-use zero-waste option? I bought a MoonCup about 4 years ago, and my only regret is that I didn’t start using it sooner. It takes a couple of tries to get used to (but so did the other options when we first started using them as young women!) but I’m so happy with it. Not only is it zero waste (menstrual cups only need to be replaced every 10 years) but it’s way more comfortable and convenient. It is cleaned either through sterilising fluid or through boiling the cup for about 5 minutes in an open pan. It’s also WAY cheaper than tampons & sanitary pads in the long run. Just try it! Look for polyethlyene or polypropylene (PP), polyethylene terephthalate (PET), polymethlyl methacrylate (PMMA) or nylon in the ingredients list. Download the Beat the Microbead app developed by Plastic Soup Foundation and the North Sea Foundation. Pre-chopped and plastic covered? No thank you! Bought loose for a fraction of the cost. Ripped, washed and ready to eat within minutes. And fresher too! I mentioned this in my condensed plastic-free guide, but this is truly one of the biggest things I can recommend! It makes such a difference and it really breaks my heart to see coffee cups in the trash when they are used for about 15 minutes. Plus, it looks cool AND offers you discounts in most coffee shops. Win-win! To be honest, most of my plastic free life has just come down to this! Planning is key when you’re trying to remove yourself from the immediate convenience of plastic. It takes some while to get used to, but soon becomes second nature! Solid shampoo: One of the best decisions I’ve made in this project is giving up bottled shampoo. Solid shampoo is becoming more and more popular, and rightly so! Not only is solid shampoo a great alternative for our planet (these bars are sold “naked”, meaning without packaging) but they are great value! So my hair is looking healthy, my wallet is happy, and I’m feeling good about my preservative and packaging free product! NEW: https://www.lush.co.uk/product/301/New-Solid-Shampoo-Bar – this is the one I am currently using! It smells like cinammon and reminds me of Christmas! Bulk buy – you can also bulk buy shampoo at certain bulk stores. If you have a product you can’t live without, buy in larger sizes (e.g.a 1L bottle) so you’re not constantly buying new plastic every few months. Shower gel is whack. Regular soap will do you just fine. As a friend recently mentioned to me, make sure to check that it is free from palm oil. Plastic packaging of snacks is all about convenience. With a little advance planning, you can have tons of great and nutritious snacks with no plastic packaging! I recommend having a few things of Tupperware (which I had lying around the house before I began my project) that you can bring out with you. For example, I often cut carrots and place them in my Tupperware as a snack I can bring around with me! Just refuse them! How much energy and how many resources were used to create this tiny piece of plastic that you’ll throw away 15 minutes after you receive your drink? Most drinks don’t need a straw anyways, but if you really feel like you’ll need one, you can buy permanent glass or steel ones that you can keep in your purse when you go out. Ah. This is a tricky one. I actually found some ‘toothy tabs’ at LUSH that allow you to chew on these little tabs that come in recyclable cardboard to reduce packaging, but I must admit, I didn’t like them as much as the conventional toothpaste I’ve come to know and love. (Soorryyy). I made toothpaste an exception for myself when I began this project, and though I am conflicted about that decision, I have a weird thing about teeth and so as of yet I’m not willing to give up conventional toothpaste. The only thing I can recommend is avoid microbeads. (See above). Water was not a big change for me in this project – I’ve used my canteen for several years and I don’t intend to stop! Carrying a canteen is an easy way to massively eliminate your plastic footprint as I mentioned in my condensed guide. You can get tons of different types and sizes and just pop it in your bag whenever you leave the house. Again, I’m relying on one of my favourite companies – Lush! They sell wonderful colourful scarf-type things that you can tie in different ways around gifts in order to reduce our waste from wrapping. I’ve always found it upsetting to see how much wrapping paper is thrown away every major holiday and birthday, and this is the perfect solution. When you buy the knot wrap, Lush gives different instructions on how to wrap it into different shapes. Awesome! Oh wow! Thank you so much for these links and recipes. I will definitely try these all 🙂 Thank you!!! Sorry – I meant to write “use a pastry cutter (u-shaped wire tool)” to mix coconut oil into the baking soda/arrowroot for the deodorant recipe. I honestly think the best is not to be perfect but to aim at it. If conventional toothpaste is something you don’t want to give up, that’s fine. There’s always something that is too comfortable to use and that you don’t want to give up. The key is to make better and more informed choices, but it also needs to be bearable so you’ll stick to it. All your choices and you general lifestyle is awesome and very inspiring, and I find that much more valuable! Wow!! Thank you so much for this comment. I absolutely and totally agree – you put it perfectly. This is an awesome post! I would love to move towards a waste-free lifestyle and I’m glad you posted something so comprehensive that I can use as a sort of guideline and cheatbook to get me where I need to be. Hey Belinda! Thanks so much for your lovely comment. Love that you’ve got that reusable bottle already! Just adopt the easy changes first and the rest will fall into place 🙂 Good luck and please feel free to comment with any questions or issues you have! I buy ‘truthpaste’ from here, it comes in a lovely little glass jar that can be reused or recycled after use. It is also free from all the regular ‘nasties’ that are in most conventional toothpaste, and one jar has lasted me over 6 months so far and I’ve still got about 1/3 left! Regarding clothing – when buying new – remember nylon, acrylic, polyester, etc are all other names for plastic. PS – I jsut got some bamboo dental floss but am considering getting so peace silk fabric to try that (it is easy to unravel fabric and absolutely no packaging). Yes – very true. I’ll update that! I’ve not tried silk fabric – if you get it, let me know what you think of it! Hey Jo! Thanks for your comment. Recycling is definitely better than nothing, but it’s sadly been pushed so much as the perfect solution when in fact it’s not! Much better to reduce at source and try to wean ourselves off of plastic.